71% of Israeli Jews consider the dispute over marriage and divorce freedom in Israel to be the most important religion-state conflict (or the second most important). 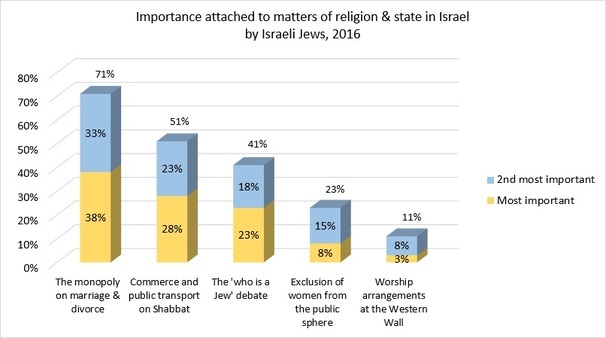 In their eyes, the dispute over prayer at the Western Wall is the least important religion-state conflict - only 11% consider it to be the most (or the second most) important issue. 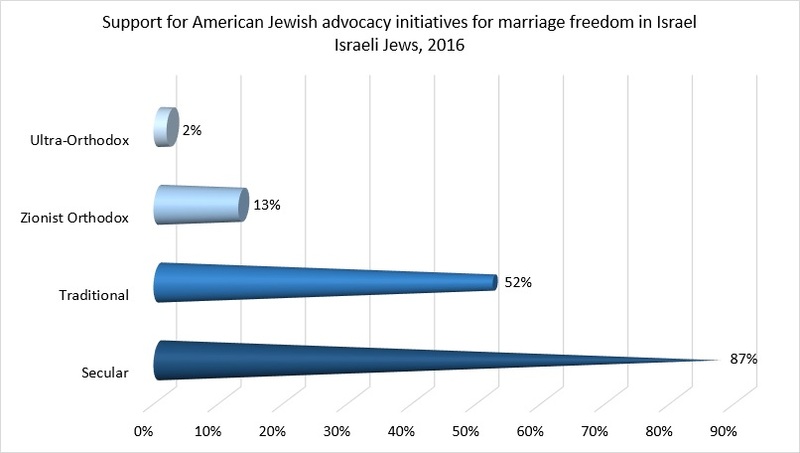 60% of all Israeli Jews and 87% of secular Israeli Jews support the involvement of American Jewish organizations in advancing marriage freedom in Israel. This survey was conducted by the Rafi Smith Polling Institute for Hiddush – Freedom of Religion for Israel. It polled Israelis on their priorities regarding the battles over religion and state in Israel, as well as their attitudes towards the involvement of Diaspora Jewry in these battles. The survey was conducted on March 29, 2016 in an online panel of 500 individuals, a representative sample of the adult Israeli Jewish population. This survey was conducted with generous support from IREP - the Israel Religious Expression Platform. 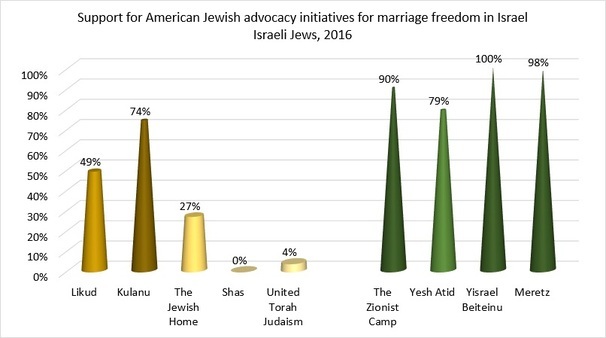 The survey results demonstrate the support of Israelis for American Jewish involvement in the struggle for religious freedom in Israel in general and for marriage freedom in particular. It is critical as a counterbalance to the political extortion of the Haredi parties, which is antithetical to the clear will of the people and to the core principles of democracy and civil society. As long as the Orthodox Rabbinic establishment controls marriage of all Jews in Israel, hundreds of thousands of Israeli citizens are denied the right of marriage in Israel, and the majority of children growing up in today's American Jewish community would be ineligible to get married in Israel, should they wish to make their home there. Hiddush's survey presents the priorities of the Jewish Israeli public in matters of religious freedom. The battle over freedom of worship at the Western Wall is clearly a justified and important battle. However, if the Jews of the Diaspora are interested in strengthening their partnership with Israeli Jews, it is critical to understand that Israelis attach far greater importance to the struggle against the Orthodox monopoly over marriage and divorce. These are issues that affect millions of people's lives, and undermine their dignity and civil liberties. They impact Israelis and Diaspora Jewry equally. There is only one solution – marriage freedom! What religion/state battles are important to Israeli Jews? The chief rabbinate's monopoly on marriage and divorce in Israel is, in the eyes of Israeli Jews, the most significant of all battlegrounds for religious freedom. 38% ranked it the most significant religion-state issue in Israel, and 33% ranked it 2nd most important. The second most significant religion-state issue, according to the public, is the battle over public transportation and commerce on Shabbat. 28% rated this most important, and 23% rated it 2nd most important - 51% altogether. The 'Who is a Jew' debate ranked third with 41% of Israelis listing it as one of their top two priorities. In contrast, the dispute over prayer arrangements at the Western Wall was considered the least significant point of contention. Only 3% consider it to be the most important religion-state conflict, and 8% consider it the 2nd most important (11% altogether). Among secular Israeli Jews – only 4% consider the Kotel conflict to be of importance! These are the Israeli public's opinions even now, at a time when the Western Wall dispute threatens to break apart the Government Coalition. Interestingly, only 21% of immigrants from the former USSR attach importance to the dispute over 'Who is a Jew,' compared to 45% of native Israelis, even though the immigrant population is considered the primary target for conversion programs to Judaism. It would seem that veteran Israeli society is more interested in the conversion saga of the immigrant population than the immigrants themselves. In contrast, the survey indicates that 73% of immigrants attach importance to the struggles for marriage and divorce freedom, and the operation of public transportation and commerce on Shabbat. To prove this point, the results are consistent with the lack of interest expressed by immigrants towards the various conversion programs offered by the Israeli government. Should American Jews get involved in advancing marriage freedom in Israel? Another issue explored in the survey is the attitude of Israeli Jews towards the involvement of Diaspora Jewry in matters of religion and state in Israel. The survey noted that “lately, a number of initiatives have been launched in the USA with the goal of advancing freedom of marriage in Israel, and establishing civil marriage in Israel in particular.” The respondents were asked, “Do you support or oppose such initiatives?” This question is of considerable importance because American Jews have historically refrained from getting involved in religion-state struggles in Israel, with the exception of the debate over 'Who is a Jew.” The positive reaction by the majority of respondents should encourage the continuation and intensification of new initiatives that have been created by major Jewish organizations in the USA. These projects represent a change in the American Jewish establishment's approach towards matters of religion and state in Israel. 60% of Israeli Jews support the involvement of Jewish Diaspora organizations in advancing marriage freedom, and only 40% oppose this. Among secular Jews and traditional Jews, 75% support US Jewish involvement, compared to 91% of Zionist Orthodox Jews and ultra-Orthodox who oppose it. It would seem that the high level of importance that Israelis attach to the matter of marriage and divorce freedom, as expressed in this survey, informs their perspectives on Diaspora advocacy efforts in this realm. Another interesting statistic: 71% of unmarried people support Diaspora involvement, compared to only 53% of married respondents. 90% of those who voted for the Zionist Camp Party support the involvement of American Jewish organizations in the battle for marriage freedom, as do 79% of Yesh Atid voters, 100% of Yisrael Beiteinu voters, and 74% of those who voted for Kulanu, led by Treasury Secretary Moshe Kahlon. Likud voters were nearly evenly split on this question (51% opposed, 49% in favor), and among voters for the ultra-Orthodox parties, almost 100% were opposed. Should Israel take into account Diaspora views on religion/state in Israel? 62% of secular Israelis responded that Israel should take into account the Jewish Diaspora's positions on matters of religion and state, on such issues as marriage, conversion, and worship at the Western Wall, as did 53% of traditional Israeli Jews. However, 73% of the ultra-Orthodox sector opposes this, as does 61% of the Zionist Orthodox community. Overall, 53% of the Jewish population supports Israel taking the Diaspora Jewish community's views into account on matters of religion and state, and 47% oppose this. In other words, support among Israelis for Diaspora Jewish involvement in advancing marriage freedom is higher than their general, more abstract, support for Diaspora involvement in matters of religion and state, although both enjoy majority support among Israeli Jews. This survey is one of a continuing series of surveys that Hiddush is conducting on matters of marriage and divorce freedom, an issue to which Hiddush attaches great importance in the context of its larger advocacy for religious freedom and equality in Israel. A previous survey, conducted before Valentine's Day, found that 71% of Israeli Jews, including 59% of voters for the Zionist Orthodox Jewish Home party, believe that the Chief Rabbinate's and Rabbinical Courts' monopoly on marriage and divorce in Israel alienates Jews from Judaism. Another survey, in honor of International Agunah Day, revealed that 75% of respondents favor the introduction of civil divorce in Israel, and 69% do not trust the Rabbinical Courts.